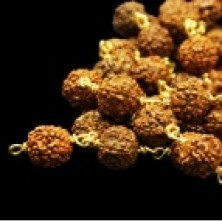 Mala of five mukhi beads of size 10mm strung in gold polished copper. Size similar to pea size. Maybe used for putting around neck or Japa.